IBM announced that its researchers have built the first complete electronic integrated circuit around a single “carbon nanotube” molecule, a new material that shows promise for providing enhanced performance over today’s standard silicon semiconductors. Size comparison between our single nanotube ring oscillator circuit and a human's hair. The achievement is significant because the circuit was built using standard semiconductor processes and used a single molecule as the base for all components in the circuit, rather than linking together individually-constructed components. This can simplify manufacturing and provide the consistency needed to more thoroughly test and adjust the material for use in these applications. A close-up view of the 5-stage CMOS type nanotube ring oscillator. 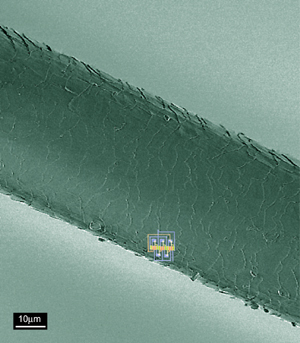 The upper right inset shows the nanotube itself with a diameter of ~2nm. The work was reported in an IBM paper appearing in today’s issue of the journal Science. For some 50 years the semiconductor industry has relied on the ability to pack increasing numbers of electronic circuits on a single silicon chip to make those chips more powerful. This was achieved largely by finding ways to build circuits smaller. With scientists seeing an end to that capability looming, the use of nanotechnology is being explored as a means to keep the industry moving forward. The field of nanotechnology involves the synthesis and assembly of new types of molecules and structures with dimensions measured in billionths of a meter. Looking like a microscopic roll of chicken wire, carbon nanotubes measure 50,000 times thinner than a human hair. Yet they have unique properties that may allow them to carry higher current densities than the “pipes” currently used in today’s transistor and, with their smaller size, might allow for further miniaturization. The circuit built by the IBM team was a ring oscillator -- a circuit chip makers typically build to evaluate new manufacturing processes or materials. The circuit stresses certain properties that can give a good indication of how new technologies will perform when used to build complete chips. By integrating the complete circuit around a single nanotube, the IBM team observed circuit speeds nearly a million times faster than previously demonstrated circuits with multiple nanotubes. While this is still slower than the speeds obtained by today’s silicon chips, the IBM team believes that new nanofabrication processes will eventually unlock the superior performance potential of carbon nanotube electronics. The IBM scientists will now use the ring oscillator to test improved carbon nanotube transistors and circuits, and to gauge their performance in complete chip designs. 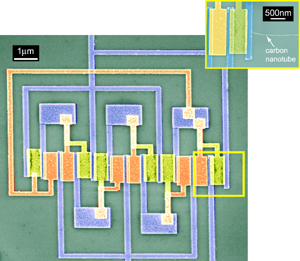 The report on this work, “An Integrated Logic Circuit Assembled on a Single Carbon Nanotube,” by Zhihong Chen, Joerg Appenzeller, Yu-Ming Lin, Paul Solomon, and Phaedon Avouris of IBM’s T. J. Watson Research Center, Yorktown Heights, NY; Jennifer Sippel-Oakley and Andrew G. Rinzler of the Department of Physics, University of Florida, Gainesville, FL; and Jinyao Tang and Shalom J. Wind of the Department of Chemistry and the Department of Applied Physics and Applied Mathematics, Columbia University, New York, NY is published in the March 24th issue of the journal Science.